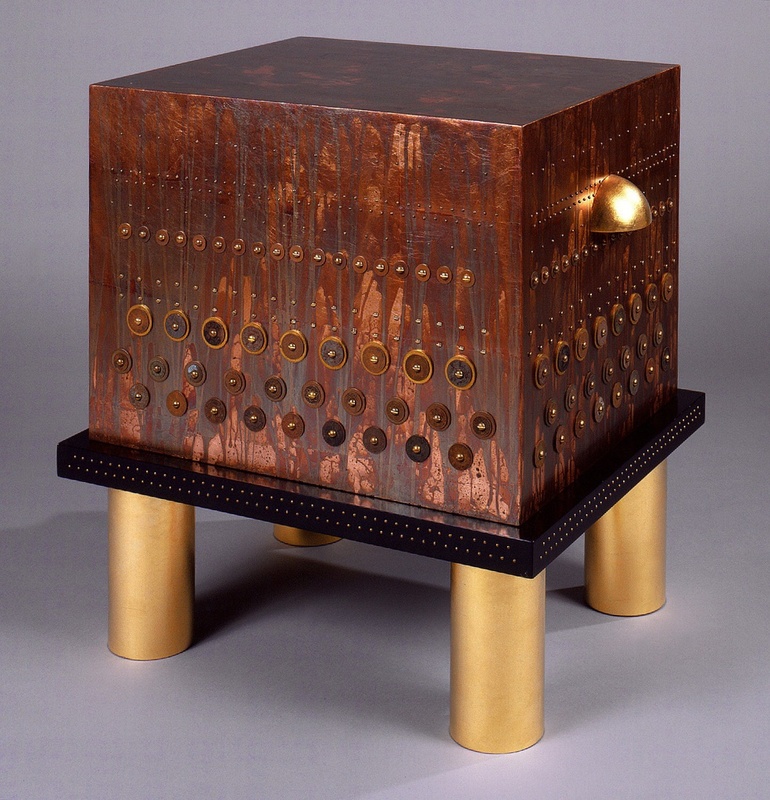 Tudor Coin Encrusted Table is one of a pair of side tables, which were shown together in 1993 at the Cooper Hewitt. The set was displayed alongside several conceptual drawings and photomontages, in which Riley juxtaposed sketches of the tables with photographs and materials that inspired their design. As the concept boards show, the tables reference the intricate adornment of historical figures, such as Henry VIII and Elizabeth I, and contemporary persons, notably the Maasai of East Africa. Riley was drawn to the similarities in how both parties use ornamentation to mark social status. Studded with Nigerian coins and lined with gold and copper leaf, Riley’s tables recall the resplendent royal costumes of 16th century England. The textured surface of the patinated table, interspersed with luminous rows of coinage, parallels the visual variety of Tudor and Maasai accoutrements. The material inspirations for the multimedia tables are represented in Riley’s sketches through pasted-on metal elements, fabric swatches, and paper samples. When it comes to executing her designs, Riley often draws on the assistance of skilled artisans. Design historian Pat Kirkham has noted that partnering with craftspeople permits Riley to produce highly imaginative work informed by intensive research that could not be executed without very specialized expertise. One of the Tudor Coin Encrusted Tables is currently on view in the exhibition, The Virtue in Vice, up through March 25, 2018. Maeve Coudrelle is a Curatorial Assistant in Latino Design. This post is elaborated from an entry in “Looking for Design,” a series exploring work by Black and Latinx designers in the collections of the Cooper Hewitt and the National Museum of African American History and Culture. Cheryl R. Riley, accessed November 2, 2017. Lowery Sims and Leslie King-Hammond, The Global Africa Project: Contemporary Design, Craft, and Art (New York: Prestel, 2010), 78. Kelsey Dalton McClellan, “Cheryl R. Riley,” Emerge: Journal of Arts Administration and Policy, SAIC. America’s Smithsonian: Celebrating 150 Years (Washington, D.C.: Smithsonian Books, 1996). Pat Kirkham, ed. Women Designers in the U.S.A.: Diversity and Difference (New Haven: Yale University Press, 2000), 139-140.